You are currently browsing the tag archive for the ‘orchids’ tag. It is still here, and I am still here. Sometimes, like these times, I get swept into a maelstrom of seemingly endless focused work hours and no sleep, and the last thing I feel like I can do is get on a computer when I finally set the work computer down for a two or three hour trifling doze of dreaming about work. Between overload and overtired, it almost took me down this time, to the depths, but MKL proved his wonderfulness again…when I called him, choice in hand, and said, “I need you to talk to me,” he didn’t ask what was wrong or why I needed this or what he should talk about. He just talked, about his day, about a phone call to his parents, about S3’s new car. Just talked. And listening to his deep, comforting, seductive voice talking about normal things that happen in lives when you have a normal amount of hours to live a life, made me choose to empty my hand and look forward to the prospect of holding his. It’s a strange thing, not living in the same house as a married couple (and yes, we’re working on it…we have a new plan.) We are not bound by the day-to-day battles over clean kitchen tables or piles of laundry or car parts, but we have made a point of identifying what our individual triggers are, and strategized on how to make it good for each of us. We’re being grown up about it. But now we are getting impatient, and more lonely for one another, and as sad as that sounds, it is a good thing. Adventures are in the offing, and I have so much to say. For now though, I may have half a day to breathe, and then back into the thick of the fray, so I thought I’d pop by to say hello. And bring you some flowers. Bullying of any kind. Against LGBTQ people. Against people of different religions. Against people of differing political views. Against people of other races. Against people of other cultures. I stand against bullying and mockery of any and all humans. I have somehow unconsciously decided to pay tribute to those lost in the insanity and hatred that lies behind terrorism by commemorating this kind of tragic day with an orchid. Here is today’s offering. As the parent of gay children, I recognize that it can be a challenge to accept at first. But my children are powerful, beautiful individuals who will make positive differences in this world. And that is what matters. Hatred, whether it takes the form of vile words, religious justification, or acts of violence…. I was going to say doesn’t matter, but it does. It matters deeply. The actions of one man last night effected the lives of countless others. Who really gives a damn who or how a human being loves, as long as they DO love, and spread that message of love and caring as far and wide as the world itself? My heart hurts for Orlando, for the victims, their friends and families whose lives will never be the same. But do not stop being who you are, and do not stop voicing your love and support. Otherwise, we will be doomed to repeat our mistakes ad infinitum. Rest well, loved ones, and know that we who still draw breath on this earth and have love on our side, will not stop fighting the fight for you. And we will fight it with love and understanding, not violence. I’ve been quiet of late. Kelsea was home for a few days, which was beyond wonderful. Thanksgiving was awesome, thanks to my darling husband. Christmas is one of my favorite times of year in terms of the energy of joy in the air, so it brings lots of poignant memories. As we also approach the anniversary of my Mother’s passing, my mood turns inward and indigo. With all the pain of violent acts in our world recently that seem to be stacking up like firewood, my heart hardly knows where to turn. And so I give you another orchid. 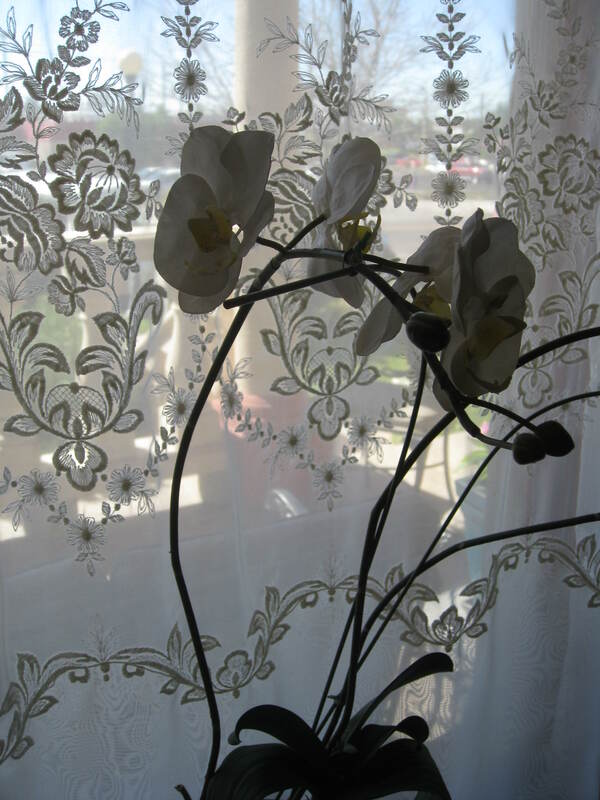 An orchid for peace. I promise that I’ll perk up and share some fun memories of Christmases past. Prayers tonight for San Bernadino.